Knowing the best way to combine your ingredients and the perfect baking environment can help you create the best muffins. This is a guide about muffin making tips and tricks. Everyone knows the best part of a muffin is the top! Before placing your tin/pan in the oven, sprinkle a bit of sugar over the tops. This gives it a little something extra special - a sweet extra crisp muffin top! Never beat muffin batter. Stir the ingredients only until you see no more dry flour. The dough is supposed to be lumpy. 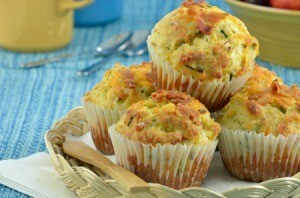 If you continue mixing, you'll have tough dry muffins which won't rise properly. When you fill muffin pans with batter, fill one of the cups with water and the other muffins won't scorch during baking. Leftover muffins can be hollowed out. Then filled with a creamed mixture and served as a luncheon dish. Ever run out of baking cups and wondered what to do? Cut a square of parchment paper to fit the bottom of the cupcake cups. Make sure to leave enough parchment paper to cover the sides of the cup. Four corners will stick up. They may not be baking cups, but they do the job when you have to have a cupcake or muffin! I would like to know what Dunkin' Donuts or supermarkets use to make the top of their muffins so crunchy and yummy? It could be something as simple as sugar. I've tried without any success in getting that nice crunch. I'm not sure if this is the kind your talking about but I make a crumble mixture with butter and brown sugar then put it on top of the muffin before baking. There are different types of decorating sugars that are coarser than regular granualated sugar we use here for baking with. Sanding sugar or decorating sugar or sparkling sugars don't dissolve under the heat of baking so it does give more of a crunch. We don't have a Dunkin Donuts around here but that is what our bakery uses on muffins and some pastries. I used to bake a lot. For really crunchy tops, I assume you mean the ones you cook yourself. You could sprinkle the top of the muffin, before baking with just plain granulated sugar, not a lot, but just some, or sprinkle the top with powered sugar. I use to use it on the tops of brownies, before baking & it worked really well. Also on other things, I used to beat up a little egg white & brush the tops of things, before baking. I also use to buy the ones donuts shops sell & I would heat it in the microwave & pop it in a really hot oven for about 10 mins. That works great for the ones you buy, because after they sit awhile, they are no longer crunchy. Here is a topping I use on my Streusal Apple Pie. Sounds like what you are looking for. Will work on muffins too. It will give you that crunch topping like the muffins in supermarkets. Whisk the crumb mixture together and pat on muffins. Bake same as the muffin recipe. Also Recipezaar has a recipe called Muffin Toppings #90227. It has three toppings. Nut Topping; Streusal Topping; and a Sugar & Cinnamon Topping. I just got a muffin top baking pan and was wondering how long it takes to bake the muffins in it? Will it be the same time or half that? Thanks. I have one but haven't used it in a while and can't remember exactly. I would start checking for done-ness right after the halfway point. Here are a couple links with tips, suggesting to turn down the oven a bit possibly. I just was thinking about trying my pan out again. I heard to use it for baking cookies that tend to spread out too much. I was going to try that. I start checking mine at 5 minutes before the directions for regular muffins. They are usually done in about 2 minutes less time than reguar ones. You can tell by when they start browning around the edges. ps- you probably won't make reqular muffins much after you try the muffin-tops! I recently bought a mini muffin pan. When I tried to bake a batch of mini chocolate chip muffins this past weekend, they came out overdone when I used the time/temp for my standard recipe. Does anybody know how long I should bake the mini muffins and at what temp? Thanks in advance for your help! I start checking the mini's after half the cooking time of the regular recipe. Once you have your baking time down it will be good for any mini muffins.